【Thicker & Higher Definition】: Our Projector Screen has thicker material and the weight is about 2.2Lbs, rather than other only 1.1 Lbs thin screen. Thicker material will make the image effect clearer, avoid the light penetration for a clear image than the low-quality products.You can experience the clearest image from our movie projector. 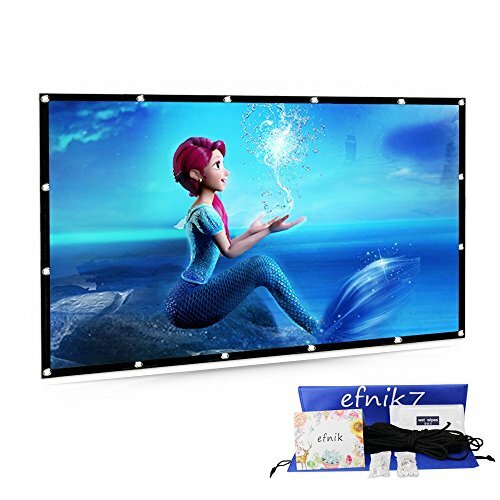 【Anti-Crease】: Efnik 7 Brand Portable Projector Screen Contains another 8% Spandex in the raw material, it will increase the elasticity and the silkiness of the Fabric to effectively prevent fold and no crease left when the screen is compressed.Meanwhile, the thicker material will have the better anit-crease effect and viewing experience than normal home movie screen. 【Easy to Install and Clean】: The movie Projector can be installed in few minutes with ropes,hooks,bracket,nails,double side tape on the wall at home or outdoor.There are 16 holes on the hd screen and we provide the free peel-and-stick hooks and 2 bundles of ropes. Meanwhile, we had provided the wipes for you, thus it can be cleaned with the wipes easily if there are the spots on the projector screen 120 inch. 【Portable Screen】: 120 inch Projector screen can fold the projector screen in small size for the backpack or suitcase,and we have specially provided one nonwoven fabrics bag for you.This portable movie screen is suitable for meetings,home theater, sport games,outdoor movie etc,It is an ideal choice for most family. So just take it with your friends or Kids wherever you want to go. It bring you a colorful life and give you more Surprise and happiness! 【Priority Warranty】: Efnik 7 team offers Priority Warranty for every customer bought hd projector screen. You can order it without any risks. If you meet any operation difficulties or quality issues of the projector screen outdoor, you can contact our professional technical team for help.Once receive the question,we will reply it within 12 hours and it will be solved until your satisfaction. Choose our Efnik 7 product, get your lifetime guarantee. Absolutely versatile and huge to beat!